We’ve seen a wide variety of weather this autumn from the warmest day of the year to snow; although early statistics (1 September – 30 November) show overall has been a fairly average season. Despite September proving to be the equal-second warmest for the UK since records began (1910) and the warmest day of the year at 34.4°C being recorded on 13th September in Gravesend, autumn temperatures have only been slightly above average for the UK as a whole. The notably warm September has been partially offset by a cold November and lower temperatures are likely to continue to the end of the month. It’s been a slightly drier autumn then average, despite some periods of heavy rain mainly due to a series of low pressure systems in November. The UK as a whole has so far had around three quarters of expected rainfall, with Scotland seeing 67% of its average while East and North East England seeing close to their long term average with 94%. 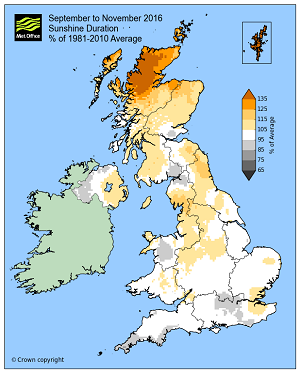 Northern Scotland looks like it will have had its third sunniest autumn on record (dating back to 1929). However overall the preliminary autumn figures show all areas, aside from southern England, have had slightly above average sunshine hours. It’s been rather a cold November, with temperatures widely around a degree or so below the 1981-2010 average. Scotland had the largest deviation from the average with mean temperatures -1.6°C lower than the 4.9°C long term average. Scotland has also had its sunniest November since records began in 1929 with 65.8 hours of sunshine. Northern Ireland’s lowest recorded temperature of the year so far was recorded this month with -7.5°C at Katesbridge on 24 November. The third lowest temperature for the UK as a whole, -12.1°C, was recorded at Braemar on 21 November. As well as cold settled conditions, November also had the first named storm of the year with Storm Angus impacting large parts of Southern England and Wales. Strong wind and heavy rain affected these areas from 17 to 22 November due to a series of low pressure systems. The strongest wind gust recorded was 80 mph at Langdon Bay in Kent on 20 November, while Exeter saw 108.6mm of rain between 19 and 22 November, nearly 80% of the average rainfall expected for Devon in November. 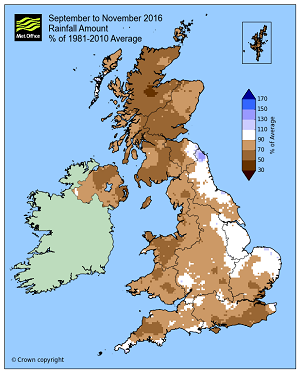 However, despite spells of heavy rain, the month has been on the dry side for many with the UK as a whole having had 89% of expected average rainfall to date, and Northern Scotland just 63%. Meanwhile the Midlands have seen 28% more than the average for November. The sun has been shining for many with the UK having 30% above average sunshine hours, and Northern Ireland topping the regions long term average by 42%. This entry was posted in Met Office News and tagged cold, dry, England, forecast, gales, heavy rain, Met Office, National Severe Weather Warning Service, rainfall, record, statistics, Storm, UK, weather, weather forecast, wet, wind. Bookmark the permalink.